Modern romance or art installation? 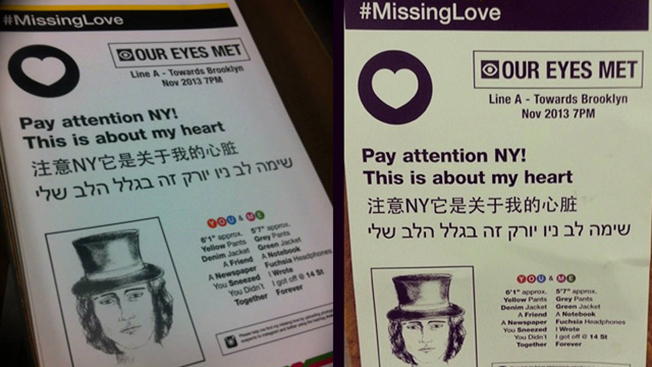 Performance artist Maria Luisa Portuondo Vila has been putting "Missing Love" posters in subway stations all over New York City, trying to find some guy in a top hat. Apparently it was love at first sight when she saw him on the subway back in November, and rather than go to Craigslist Missed Connections like every other heartbroken human being, she created 300 posters that vaguely describe their fleeting moment. Since pretty much every public occurrence of note in New York is a marketing stunt, people figured these were fake. Vila even describes the effort as an "art action," but when contacted by Gothamist, she insisted she's being genuine. If that's true, how hard could it be to find someone walking around in a top hat in 2014? Oh wait, he was headed to Brooklyn. Probably pretty hard, then.